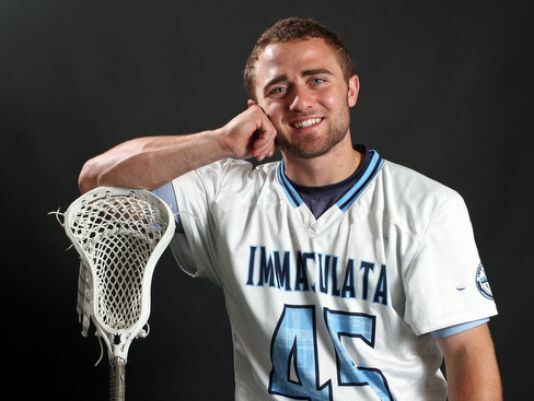 Specialist — Paul Rasimowicz, Immaculata, Jr.
Rasimowicz, a faceoff ace, helped win possession for Immaculata game after game, as the Spartans raced to the Non-Public B title. 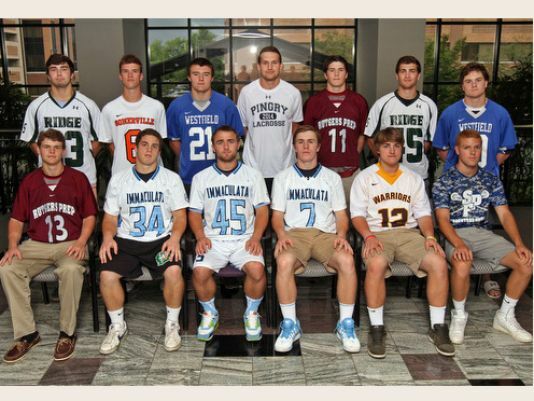 Attack — Ryan Cunningham, Watchung Hills, Jr.
Cunningham, the unquestioned leader of Watchung Hills’ offense, scored 46 goals and was recognized as an All-American. Attack— Logan LeBlond, Somerville, Sr.
LeBlond, an All-American himself, finished eighth in the state in points with 110, scoring 45 goals and adding 65 assists for the South Group II champs. Attack — JT Palladino, Ridge, Sr.
An All-American who netted 40 goals and 34 assists, Palladino will play collegiately at Harvard after a standout career for the Red Devils. Attack — Luke Prybylski, Westfield, Jr. In guiding Westfield to the North Group IV title, Prybylski scored 48 goals, with 12 of those goals coming in the postseason. The junior is also an All-American. Midfield — Jack Harvey, New Providence, Jr.
Harvey, the fifth-leading scorer in the state, posted 122 points to break the New Providence record. He’s already the school’s all-time leading scorer with a season to go. Midfield — Evan Key, Pingry, Sr.
Key led Pingry with a stellar season, posting 31 goals and 24 assists to earn All-American honors, as the Big Blue went 14-5 one season after a 2-13 mark. Midfield — Tom Smith, Rutgers Prep, Jr.
Smith scored his 100th career goal and went over 200 career points this season, totaling 64 goals and 102 points for the Argonauts. Midfield — Chandler Vanderbeek, Immaculata, Sr. The heartbeat of Immaculata, Vanderbeek earned the Courier News’ Player of the Year honors by scoring 47 goals and adding 12 assists, while playing at an All-American level. Defense — Sal Fama, Immaculata, Sr.
A true shutdown defender, Fama took on the challenge of covering the opponent’s top-scorer game after game, helping the Spartans allow just 6.75 goals per game. 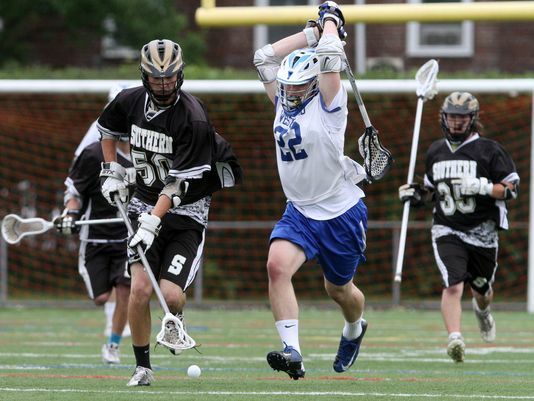 Defense — Brian Heath, Scotch Plains-Fanwood, Sr.
Heath, the Kimber Division’s Defensive Player of the Year, backboned a Scotch Plains-Fanwood defense to a 16-4 record. Defense — Jackson Simcox, Westfield, Jr.
Just a junior, Simcox was instrumental in Westfield’s turnaround, as the Blue Devils won their first sectional title since 1987. Goalie — Christian Klipstein, Rutgers Prep, Jr.
Klipstein posted a save percentage of 68.5 and consistently dominated for Rutgers Prep, making a name for himself in the process. Goalie — Owen Molloy, Ridge, Sr.
Molloy, an All-American, was superb in the Somerset County Tournament final, making 12 saves to earn MVP honors, as Ridge repeated. You could say that playing lacrosse at Immaculata High School is something that Chandler Vanderbeek was born to do, even if he got to high school thinking he would be a football player primarily. But four years, 96 goals and 125 points later, Vanderbeek will be remembered as one of the very best players to wear the Spartans’ jersey, just like his older brother Taylor before him. Chandler, along with his twin brother Connor and younger brother Griffin, helped lead Immaculata to the Non-Public B sectional title this season in his final year before embarking on another journey of family and lacrosse with Connor — the two will play at High Point University next year, rooming together in the dorms along the way. But Chandler said that it wasn’t his original goal four seasons ago to turn himself into a lacrosse star. Chandler is the Courier News Player of the Year. With 47 goals and 59 points this season, Chandler elevated himself into Immaculata’s elite category, according to head coach Tom Mott, who’s been with the program since its inception in the late 1990s. Chandler credits Connor and Taylor, who is a rising senior captain at Hobart College, along with Griffin, a rising junior for Immaculata who scored a team-best 48 goals this spring, with his development as a lacrosse player. For all of the memories that Chandler and his brothers and teammates have accumulated over the past four seasons, he said that one will always stand out more than the rest, if only because it was relatively unexpected from the outside. Immaculata hosted national-power St. Anthony’s (N.Y.) — team that finished the season ranked No. 15 nationally — on March 29 of this season and fell behind by four goals at the half. But Chandler netted a hat trick, Connor added a pair and Griffin had his coming out party with four goals, as the Spartans tied the score and forced overtime. In the extra period, Chandler scored the game-winning goal, eventually ending up at the bottom of a dog-pile he said he’ll never forget. As the season unfolded, the Westfield High School boys lacrosse team continued to chug away and keep focused on the goal that head coach Pat Tuohy laid out. Westfield took out defending state champion and second-seeded Ridge in the semifinals and then blasted top-seeded Bridgewater-Raritan for the title in Tuohy’s second year at the helm. He is the Courier News Boys Lacrosse Coach of the Year. Westfield would go on to beat Southern 10-6 for the Group IV state title, the school’s first state title since 1987. Tuohy, a Westfield resident that volunteered with the program in between tours of duty in Iraq with the Marine Corps in the early 2000’s, before graduating from Roanoke College in 2006. He returned home to work with the JV team and eventually take over the top squad two seasons ago. He’s seen the program grow to new heights under his leadership and Tuohy said she’s excited for the future of Westfield lacrosse. With a host of juniors and underclassmen coming back next season, expect the Blue Devils to continue moving up the ranks. BRIDGEWATER – After racking up the goals en route to earning the NJSIAA Non-Public B boys lacrosse title, Immaculata ran into a buzzsaw against Ridgewood on Saturday in the Tournament of Champions quartefinals. The Spartans closed an early gap to one at 3-2 near the end of the first quarter, but Ridgewood went to work from there, scoring eight of the next 10 goals to earn a 16-8 victory at Bridgewater-Raritan’s Basilone Field. The teams combined for 21 penalties in the game, with 14 of those coming in the second half. Ridgewood (15-7) capitalized for three man-up goals and Immaculata (15-5) converted two of its man-up opportunities. Immaculata coach Tom Mott, unhappy with the way the game was called, expressed his displeasure following the game. “Things did not go our way in terms of calls. There were things that were not called all year that were called today. I’m sure they are frustrated, just like I am. College officials come back and change everything,” he said. Ridgewood will play top-seeded Delbarton in Wednesday’s T of C semifinals, with a spot in the championship game on the line. Twin brothers Chandler and Connor Vanderbeek each netted two goals and younger brother Griffin had a goal and an assist for the Spartans, who netted five of their eight goals in the second half. “They fought at the end, to the last minute, which is really all I can ask for,” Mott said. Ridgewood outshot Immaculata 34-26, and the Spartans hit a pair of posts in the third quarter, when they were trying valiantly to come back and make a game of it. Matt LoParo paced Ridgewood with four goals and two assists and Andrew Seiter netted four goals for the Maroons, who received points from seven different players. But in the end, the penalties were the story. In the second half, the teams were whistled for 14 penalties, some of which were questionable on the field. Mott also noted that he thought Ridgewood’s faceoff men got away with some moves on the x that weren’t legal, in speaking after the game. When asked what the difference was in the first half, when Ridgewood took off running for good, Mott was blunt. The loss capped a roller-coaster ride for Immaculata, which won the Non-Public B title on Wednesday night by a score of 17-13 over Morristown-Beard. The Spartans outscored opponents in the Non-Public B Tournament by a combined score of 46-20, regaining the title that Rutgers Prep ripped away form them just one year ago. Chandler and Griffin Vanderbeek finished their careers on Saturday with 125 and 132 points, respectively. BRIDGEWATER – For nearly the entire first quarter on Saturday afternoon, Group IV champion Westfield High School boys lacrosse team dominated the flow of play against Mountain Lakes in the quarterfinals of the NJSIAA Tournament of Champions. After Luke Prybylski netted his 12th goal of the postseason to put the Blue Devils on top 1-0 at the 9:22 mark, Westfield held the lead until the final seconds of the stanza. With nine ticks left in the opening quarter, Mountain Lakes’ Brad Smith netted his first of four goals to tie the score and just seven seconds into the second quarter Christian Cuccinello went on his own four-goal tear, erasing the Westfield lead and turning it into a 13-6 victory for the Lakers at Bridgewater-Raritan’s Basilone Field. Cuccinello netted four of his game-high five goals in an 8:40 stretch in the second quarter, putting the Lakers up 5-1 in the process. From there, he and Smith — who finished with four goals and three assists — led the way as the Group I champs scored nine straight goals in the middle periods to seize control. Cuccinello, a senior, impressed his coach with his ability to take the game over and turn a deficit into a victory in the blink of an eye. Prybylski, who entered play with 46 goals on the season, book-ended the Mountain Lakes run with his 13th goal in five NJSIAA postseason games. Chris Aslanian added two goals and Pat Decker and Dan Huber each found the back of the net in the second half for Westfield, which turned a mid-season swoon into a surprising run through the past two Tournament of Champions winners — Bridgewater-Raritan and Ridge — in the North Group IV Tournament and the South Group IV champion Southern Regional, to reach the Tournament of Champions. SOMERVILLE – For the first time since before any of the active members of the team were born, the Westfield High school boys lacrosse team has won a state championship. Behind the stellar play of its defense and seven goals combined between Pat Aslanian and Luke Prybylski, Westfield defeated Southern Regional, 10-6, Wednesday for the NJSIAA Group IV title at Somerville High School. The North Group IV champion Blue Devils hadn’t won a state title since taking back-to-back titles in 1986 and 1987, and the school wasn’t able reach a group final since 1988. Against the South Group IV champion, Westfield (12-9) got off to a flying start in the opening quarter, outscoring Southern 4-2, as the teams traded goals in the final 34.4 to close the stanza. Pat and Chris Aslanian had teamed with Prybylski to get the Blue Devils off to a 3-0 start in the first 7:20 of the game, but Chris Smith netted a pair of man-up goals to bring the Rams within one. Prybylski scored an unassisted goal with 8.2 seconds left in the quarter to give his squad just a bit of breathing room going forward. Prybylski and Pat Aslanian each scored in the second quarter, sandwiching a Brendan Mullen goal, to send Westfield into the half up 6-3, and despite only outscoring Southern 4-3 in the second half, the damage was done. The Westfield defense, which came into play allowing 8.15 goals per game, shut down a potent Southern (20-3) attack – one that featured three 50-plus goal scorers on the season. Dylan Jinks, who has more than 300 points in his career for the Rams, was held to just one goal and two assists and Shawn McManus – who entered the game with 50 goals and 41 assists – netted just one second-half goal. Southern made a charge in the fourth quarter, at one point cutting the lead to 8-6, but Pat Decker and Pat Aslanian each netted goals in the minutes following McManus’s goal to clinch the win for Westfield. With the win, Westfield will be one of the six teams left standing, and will take part in the Tournament of Champions – which will get underway on Saturday with a double-header at Bridgewater-Raritan High School. The Blue Devils, winners of six in a row, won’t be an easy out for any of the other group champions. NEW PROVIDENCE – After losing two of its last three regular-season games and allowing 23 goals in the two losses, the New Providence High School boys lacrosse team has turned its season around at just the right time. Four days after taking out Lower Cape May by a score of 12-1, the fourth-seeded Pioneers nearly replicated that score against 12th-seeded Delaware Valley on Tuesday. Behind the stellar play of goalie Garrett Pope and the defense in front of him, New Providence (16-4) toppled the Terriers 11-1 in the quarterfinals of the NJSIAA South Group I Tournament. With the victory, the Pioneers will travel to top-seeded Rumson on Thursday with a spot in the sectional final in the balance. The high-scoring trio of James Burke, Jon Ebert and Jack Harvey made sure that the Pioneers would have more than enough goal-support to take down Delaware Valley, as they combined for eight goals and three assists on Tuesday. Burke netted all three of his goals in the opening half, with two of those coming in the first quarter, and Ebert scored two of his three in the first 18 minutes of play. Harvey – who leads the team with 111 points on the season – picked up two goals and two assists, with both goals and one of the assists coming in the fourth quarter with the game no longer in doubt. Quinn Killeen chipped in two goals and Steve Anderson hit for a goal to round out the New Providence offensive attack, in a game where it out-shot Delaware Valley 23-12. The Terriers didn’t get on the board until the 5:04 mark of the third quarter, when Alex Pfreundschuh converted a pass from Matt Nugent. Throughout the contest, Delaware Valley couldn’t seem to put multiple passes together to put any pressure on Pope and the New Providence defense. Pope, who’s allowed 5.2 goals per game this season, made just six saves in the win and deflected a lot of the credit to the defenders playing in front of him after his second straight game allowing just one goal. 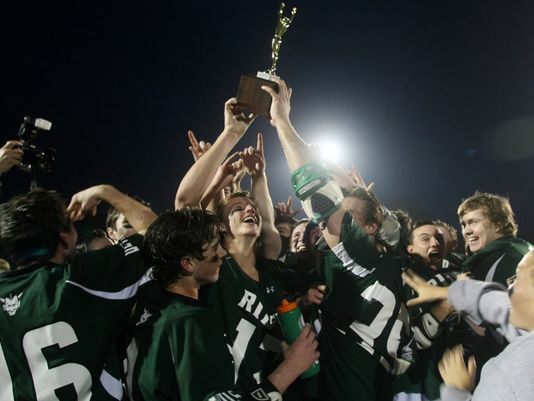 RIDGE – Sean O’Brien netted the game-winning goal midway through the fourth quarter to lift the Ridge High School boys lacrosse team to its second straight Somerset County Tournament title, 8-6 over top-seeded Immaculata, Thursday night on its home field. O’Brien also netted the final goal of the night with 1:22 left to put it out of reach for good, giving the third-seeded Red Devils their fifth straight victory overall. “I felt great before that first goal and I knew that their goalie would retreat once JT took it up, so I stepped out and set up and put it in,” O’Brien said. JT Palladino, an All-American who will play his college lacrosse at Harvard next spring, assisted on both of O’Brien’s goals and was one of eight Red Devils to record at least one point in a comeback effort. Ridge (12-5) received a sterling performance from game MVP Owen Molloy, who made 12 saves in the net and thwarted many of Immaculata’s chances to backstop his squad to yet another huge victory. Molloy and Immaculata goalie Joe Riccadonna put on a show throughout the night, as the two goalies combined for 22 saves, with Riccadonna making eight stops in the Spartans’ net. Molloy was quick to praise his counterpart after the game. Ridge didn’t get on the board until 11 minutes into the game, when Rich McKenna converted a pass from Gavin Kirkwood, but the Red Devils absolutely owned the second quarter, to seize some of the momentum. Ridge had possession for the first six minutes of the quarter, after winning the faceoff, and although they couldn’t score during that spurt, the effort never wavered and in the final minute of the half, Kirkwood tied the score when he ripped home his 17th goal of the season with 57 seconds left. Immaculata (12-3) won the ensuing faceoff, but after Molloy made a save, Liam Derkasch scooped up the ground ball and raced down field and scored with 14 seconds left in the half to put Ridge on top for the first time. In the third quarter, Ridge received a scoring boost from an unlikely source, as sophomore Matt Mullan netted a pair of momentum-swinging goals in a two-minute span to give Ridge a lead going into the fourth quarter. Ridge head coach Ken Marsh said that Mullan has been battling an injury and hasn’t played much since the beginning of the season, but he’s getting healthy just at the right time. Connor and Chandler Vanderbeek scored back-to-back goals for Immaculata spanning the end of the third quarter and the beginning of the fourth quarter, tying the game at 5-5. The twins scored three of Ridge’s six goals on the night, but none after the 11:28 mark of the fourth stanza, when Chandler went flying through the crease to beat Molloy. Kevin Quigley gave Ridge the final lead of the night at 6-5, when he took a pass from Alex Gaydos and beat Riccadonna at the 7:44 mark of the final quarter. O’Brien’s first goal pushed the lead back to two at 7-5, but Griffin Vanderbeek brought the Spartans back within one less than 30 seconds later. CLARK — As head coach Samantha Warner put it best, team beats talent every time and on Monday night against one of the top teams in the state, the Westfield High School girls lacrosse team fell short of a county title. Despite trailing just 7-4 at the half, third-seeded Westfield (10-7) was shutout over the final 25 minutes by top-seeded Summit (15-1) and fell by a final of 12-4 in the Union County Tournament Final at A.L. Johnson High School. Warner, in her second season as the Westfield head coach, took the Blue Devils to their first UCT Final, but they couldn’t hang with the high-flying Hilltoppers in the second half. Sam Paoletti scored a pair of first-half goals and Gwyn Devin and Anna Tanji each netted a goal for the Blue Devils. Paoletti’s second goal, on a free position shot, came with just 17 seconds left in the half and temporarily gave Westfield hope, but Summit’s attack was too much in the second half. Junior goalie Mallory Weisse came up with eight saves for Westfield, including a pair on the doorstep early on to thwart Summit’s chances. Even with the loss, Warner said she’s seen tremendous growth in the program since taking over, and she only expects the good things to continue coming. Summit 9, Westfield 3: Chris and Pat Aslanian and Chris Callahan each netted goals as second-seeded Westfield fell to the top-seeded Hilltoppers in the boys UCT Final at A.L. Johnson High School. The Blue Devils couldn’t get into any bit of an offensive rhythm, registering just nine shots in the game and constantly being hounded when they possessed the ball. Pat Aslanian got Westfield (6-8) on the board with 1:27 left in the first half, just 12 seconds after Summit had gone up 4-0. But Summit tallied just before the half ended and scored four of the last six goals to pull away. Chris Callahan’s goal came with 3:24 left in the third quarter and Chris Aslanian netted his goal early in the fourth quarter after taking a pass from Pat Decker. Summit (15-1), ranked No. 4 in LaxPower.com’s most recent poll, came into the game allowing just 3.75 goals per game, and held the Westfield attack to below that. SOMERVILLE — The latest chapter of the local rivalry between the Somerville and Immaculata High School boys lacrosse programs was decidedly one-sided in Saturday’s Somerset County Tournament semifinal. Right from the start, top-seeded Immaculata stuck it to the Pioneers, eventually running away with a 13-0 shutout victory and earning a spot in the county final next Thursday. Senior Joe Riccadonna manned the net for Immaculata (12-2) and made seven saves in what he said was the first shutout of his career. But even after pitching a shutout in a semifinal round of the county tournament, Riccadonna was quick to give praise to others. LeBlond, Somerville’s leading scorer, had very few quality looks at the net, as the Immaculata defense constantly double-teamed him and prevented the Pioneers from getting going. While the defense was busy shutting down LeBlond – who entered play with 79 points – and his attackmates, the Spartans offense was clicking on all cylinders. Chandler Vanderbeek netted four goals, twin brother Connor added a pair and Mark Swintek led all scorers with two goals and five assists. Jacob VanLeenen chipped in a goal and three assists and Wyatt Agaisse netted a pair of goals for the Spartans. The third Vanderbeek – Griffin, a year younger than Chandler and Connor – added a goal and an assist. It wasn’t until late in the second quarter when the game got fully away from Somerville (11-4). Through the first quarter and a half, Immaculata only led 3-0, but the Spartans got goals from four different players in the final 6:23 of the half to pull away. With the schools less than a mile apart, there was added incentive to come out with the win, at least in Riccadonna’s eyes. “It was fun playing against Somerville in the semifinals and by beating them, they’re just right down the street, and we’re big rivals with them, so getting this win was exciting and this is our time to shine,” he said. The Spartans will play the winner of Pingry and Ridge in Thursday’s final at Ridge High School. The opening faceoff of the final is scheduled for 7 p.m. But with so long between games – four days is irregular at this time of the year – Immaculata knows it has to keep working. “We just need to stay focused over these next four days, because we still have work to do; we’re not perfect,” Chandler Vanderbeek said.